I saw your ad on craigslist for the New Delonghi 4 Slice Toaster http://toronto.en.craigslist.ca/tor/hsh/1509590651.html . You say that you got it as a gift and you are selling it just because "its not working properly". Obviously I am interested, if it is a real Delonghi for only 8 bucks. I am not stupid enough to not buy a toaster just because it doesn't work. Now I am no toaster genius or nothing but do you think that it may work better if you put the stuff inside the toaster instead of just resting it on that thing on the top. Just asking. Anyway let me know if it is still available. Also, I was wondering if you would be willing to trade for something of mine that doesn't work... my husband maybe??? BAHAHAHA. Just kidding. I do have a microwave in similar condition (meaning when I rest crap on top of it is doesn't get hot) let me know if you will consider a trade. Beautiful black and stainless steel design best toasters . I love the defrost mode for this toaster it is great for frozen waffles. With two kids getting breakfast ready quickly is a must. My boys love frozen waffles and with the defrosting mode it cooks the waffles quickly and perfectly. 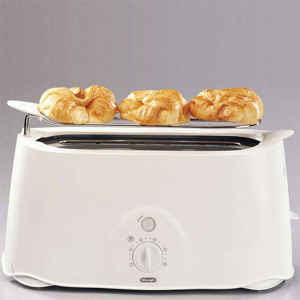 This is a great toaster with a beautiful design that will match your décor…..